Mullayanagiri is the highest peak in Karnataka, India with a towering height of 6330 feet This panoramic hilltop is nestled in the eastern region of Chandra Drona range of Western Ghats, and flanked by the famous Himalaya and Nilgiri mountains. This lofty summit is a trekkers’ paradise and presents a stunning sight from the zenith of the peak, especially at sunrise and sunset time. A small temple is located at the top of the mountain. This temple is dedicated to Lord Shiva. This temple has been one of the important pilgrimage sites for hundreds of Lord Shiva’s devotees. However, this peak is not favorable for trekking during monsoon. Hence, if you are keen to trek this hill, spring and summer seasons are the best. 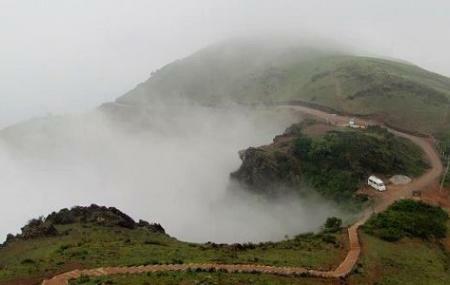 The spectacular landscape of Mullayanagiri is accessible by car and other road-based vehicles. Also, visit the popular attractions in the city by following Chikmagalur itinerary 2 days. During early morning hours, the peak is usually covered by mist. So be careful while trekking. This trek is not suitable for novices. Warm clothing and woolen caps are an absolute must on this trek. Carry adequate drinking water, beverages and snacks. People who have fear of heights should avoid this trek. You can visit the peak any time of the day. However, morning hours are preferred for safety reason. By Bus: While going towards Baba Budangiri, get off at the foothill of Mullayanagiri. People normally club together Sakaleswara Temple and Baba Bundangiri while planning their visit to Mullayanagiri. People also prefer to start their day with Mullayanagiri.